One of Seaside&apos;s hidden gems is the Bayonet & Black Horse Golf Courses, which consist of two beautifully groomed courses rated among the top on the Monterey Peninsula. The coastal courses shine with their emerald green fairways, challenging play and breathtaking views of the Bay. Formerly part of the former Fort Ord Army base, the courses were made public in 1997. Since then, Bayonet & Black Horse has quickly emerged as a popular set of championship-level public courses. 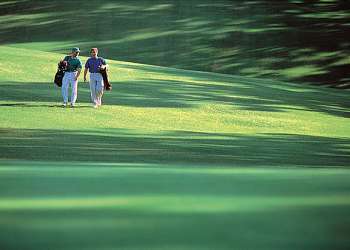 Both courses are steeped in rich tradition, and have played host to PGA Tour greats such as Palmer, Nicklaus, and Watson, as well as several U.S. presidents and foreign dignitaries. The Bayonet & Black Horse golf courses were recently fully renovated. Non-native trees were removed, opening up the view of Monterey Bay, and Jacklin T1 Bentgrass was planted throughout the tees, fairways and greens to improve play. In addition to course renovation, a luxury resort and spa are in the planning stage of development. Keep an eye out for an upcoming resort community on the property, complete with a Fairmont Hotel.